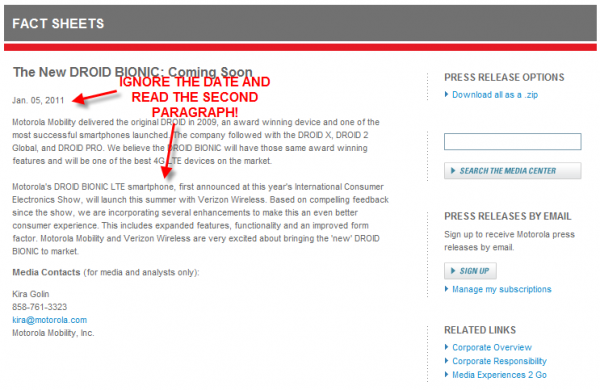 Yesterday, we first reported that the DROID Bionic was slowly being removed from Motorola’s site, which came as a little surprise since we all know that it has been delayed until this summer while Moto enhances it. That removal though, is now complete and the only page left that even mentions the word “Bionic” is the one you are seeing above. And this updated page (even with that old date on it), talks of a “new” Bionic that sounds exactly like the one we’ve been hinting at for 2 weeks now, the Targa. Here is the most meaningful quote from the release which points out that the original Bionic is not the one you’ll be seeing this summer – something we’ve been telling you over and over again since that first cancellation rumor came out. Based on compelling feedback since the show, we are incorporating several enhancements to make this an even better consumer experience. This includes expanded features, functionality and an improved form factor. Motorola Mobility and Verizon Wireless are very excited about bringing the ‘new’ DROID BIONIC to market. I know you are all disappointed that a dual-core phone won’t be hitting Verizon store shelves in May, but trust me again when I say that you’ll be more than satisfied with this new version. It’s destined to make every other phone on the market look silly. Even those gimmicky 3D ones.